I've done an Oreo Inspired cocktail before, but it's been a while so I decided to revisit and revamp a bit. Back in those days I was heavily into flavored vodkas and used vanilla vodka with creme de cacao. This time I thought it might be fun to try with bourbon and a favorite coffee liqueur. I was also a little inspired by the Drunken Oreo Truffles I'd made a few months back. I added a dash of salt and a couple dashes of chocolate bitters to tone down the sweetness. These also give the cocktail additional depth of flavor. Garnish: Equal parts dark cocoa powder and espresso powder for rim, whipped cream, Drunken Oreo Truffle stuffed Oreo cookie. Optional: Extra chocolate pieces of the Oreo cookies minus the cream centers sprinkled on the whipped cream. 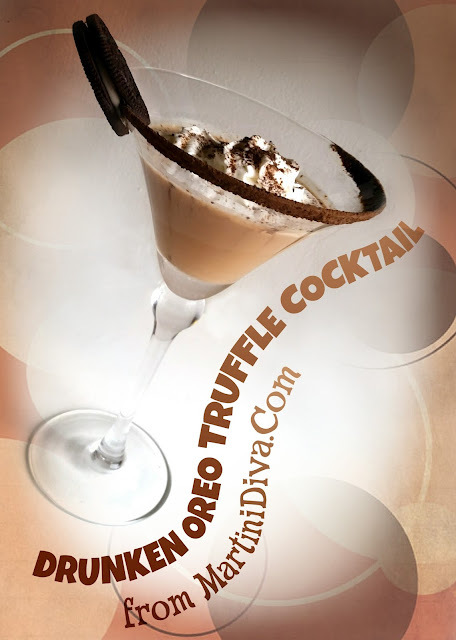 DIRECTIONS: Prepare the drunken Oreo truffle mixture from my recipe link above. Spread this on scraped off Oreo cookies then sandwich them back together. Dip half the rim of your glass in some of the coffee liqueur, then into the cocoa and espresso powder mixture. Chill glass in the freezer. Add all the ingredients to a cocktail shaker filled with ice and shake until chilled. Strain into your chilled glass, top with some whipped cream, dust on some of the crumbled Oreo cookies and slide a Drunken Oreo Truffle stuffed Oreo cookie onto the rim. Serve and enjoy. The great thing about this cocktail recipe? 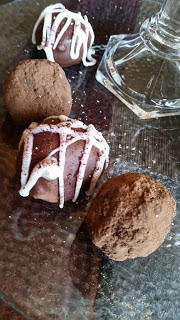 You have all that great Drunken Oreo Truffle mixture left over to make truffles with.